Home / Articles / UAE Ban / uae visa / UAE-Blacklist / UAE-Employment-Law / UAE-Immigration / UAE-worker-rights / Can Former UAE Residents with Entry Ban Avail Amnesty? Can Former UAE Residents with Entry Ban Avail Amnesty? Today we are targeting Amnesty seekers from outside country in our helpful guide, which comes after many queries and comments on our blog and Facebook page regarding Can former UAE Residents Apply for UAE Amnesty? I already left UAE, can I apply for Amnesty from my country? Can someone who exit the country, come to UAE and apply for UAE Amnesty? 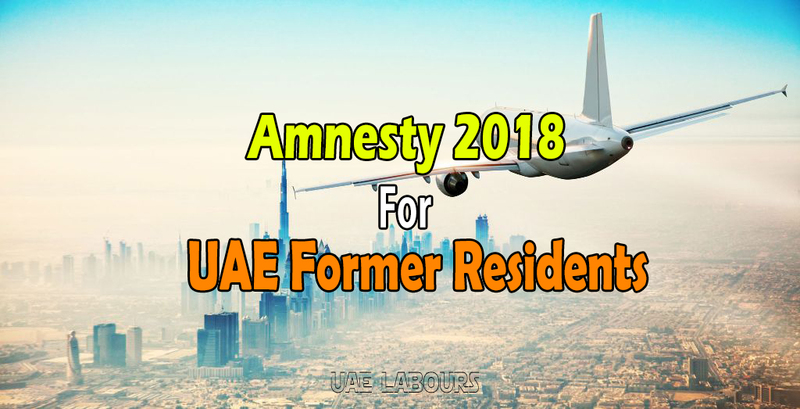 Can former UAE Residents avail UAE Amnesty 2018? Can former Residents with UAE Entry Ban apply for Amnesty? Can former Residents with absconding case utilize UAE Amnesty? Can people with Blacklist or lifetime ban avail Amnesty from outside country? Above are the questions we’ve been asked by many from different countries, people reviews about UAE Amnesty 2018 are coming in positive, UAE 2018 Amnesty Scheme is helping hundreds and thousands of illegal expats in UAE, Pakistani, Indian and Filipinos are the most in numbers who have already availed the Amnesty. Till today August 11, 2018 everything is going very well, Immigration staff are working Saturday to Thursday from morning 08:00 am – 08:00 pm in-order to fulfill the requirements of Amnesty seekers in UAE. Communities across globe appreciated UAE Government for this great effort which helped thousands across United Arab Emirates, credit also goes to News websites, Informative blogs and Social Media Platforms who’ve published special articles and informative guides regarding UAE Amnesty 2018. Gulf News, Khaleej Times and UAE Labours. Few days back we received screenshot of a website by our reader in which it was stated that former UAE Residents can apply for UAE Amnesty. The content of that screenshot was “people with minor crimes such as entry ban, or residency violation may be able to return to the country to avail UAE Amnesty scheme”. 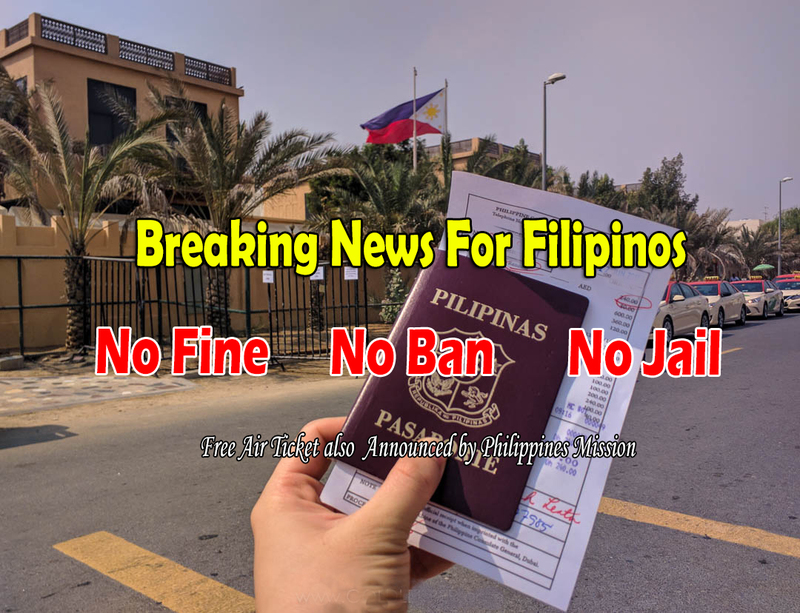 They also stated, “Former residents who got UAE Entry Ban while leaving country can apply for tourist, resident or investor visa through normal channels during the Amnesty 2018 period”. After reading above news about Former Residents entry and availing of Amnesty Scheme, we checked the source of it, as per news website the spokesman was not the official person and want to be unnamed on media. Can Former Residents Re-enter UAE to avail Amnesty? So, it is confirmed that the above highlighted news was not from official source or platform, it means it was just a rumor, let’s come to the point now…! As per a senior UAE official, who clarified that former residents, who are facing ban from re-entering UAE cannot avail the amnesty 2018. In simple words, all those who wants to apply for amnesty and are facing UAE entry ban due to their violation of UAE Law, cannot enter the country or cannot remove their ban using UAE Amnesty 2018 scheme. This announcement came from a senior official of the Federal Authority for Identity and Citizenship which recorded by Gulf News on Sunday at Shahama Center for amnesty seekers in Abu Dhabi. Who can Avail UAE Amnesty 2018? As we stated in our previous Amnesty guide, this 3 months UAE Amnesty scheme is only for foreigners who are currently living (residing) in United Arab Emirates. In other words, expats residing in any state of UAE illegally (overstay people, runaway, absconders etc.) can utilize the amnesty scheme to either regularize their visa status or to exit the country without paying overstay fines. So, please do not waste your money by trying to get visit or tourist visa in-order to apply for amnesty, always try to reach and follow announcements from UAE official source, we hope it is now clear to everyone that former UAE residents cannot apply for Amnesty 2018 or UAE Amnesty 2018 is not applicable for former residents. its mean no chance for former Residents or may be in future they think about former residents. Yes there is no chance so far, hopefully UAE Government will think about former residents. I would like to ask if I was deported from Abu dhabi and been in jail for overstaying and as what they inform me that I'm blacklisted . Is there's any chance for me to get visa for UAE ? or any chance for my case to be solve ? I did the eyescan and the finger scan when I was leaving from the airport I'm Jordanian I left in 2013 , is it possible for me to make amnesty? No, you cannot avail amnesty 2018, hopefully it is only possible if UAE Government announced something for former residents with entry ban. UAE LABOURS is there any update for former residents? ? Its 2nd month of amnesty maybe they will give chance also thanks! Soon, UAE will open door for Foreign Nationals to get 6 months temporary residence visa. Uae labours still no news for former residents with absconding due to the employer who cant give visa and just went home and got banned? I thought there is no ban since 2016? Why some officials in airport got eye scanned for my friend. Have mercy pls! He is innocent but due to lack of knowledge his employer ruined his papers all he wants is to just work uae and this happened, there is no space for innocent people for employers who are thinking themelves only. UAE GOVERNMENT please boos, give them a chance you know they only working for them family, they are humans also. I have a 1 year ban is it covered with amnesty? If someone that enter uae legal but have overstay of 3 year an want to go back to her country but her passport is lost an now she don't have passport only passport copy will the person be given ban for 2 years? What are you waiting for? Amnesty is for you people, go and apply for amnesty, you fine will be waived and you can easily get new passport through your consulate. hi can any one tell me how to check if i have 1 year ban or life time? i was giving judgment by judge in Aweer immigration judgment was 1000 dhs fine and deport i have paid 1000 fine but i dont no if it is a life time or 1 year. Hi i am a former resident in UAE I took a house cook visa (diploma holder in media., and professional photographer) while I am applying for the visiting visa it is showing blacklisted but former sponsor don't know anything I contact him and he replied he didn't have any problems with then why I am blacklisted? Hi!I am a former resident in UAE who already finished a 2 yr immigration ban.Can I apply for a tourist or visit visa?i hope UAE will open the door to former resident who had a absconding case to enter and work again. I finished my limited contract for 2 yrs in my 1st employer, after getting gratuity and cancellations i found a new employer, and they did not let me exit, because they promised me that they will issue my visa, i trusted them, eventhough im worried, they let me work without proper visa i only have my license in my profession, then they failed to process my visa, my ex employer filed an absconding case against me, and got banned to uae for 5 years, why i need to suffer this situation well in fact its my new employer who really caused this problem, now i lost my career and waiting for 7 months in my country waiting for the promises of my new employer that they will get me back, but i dont really know if they really doing something, they put me to nothing, they dont know what sacrifices made just to get license to work for my family, this is injustice, unfair! I hope all the legit websites of the uae government will help me to get through this.thank you! My friend run away from her employer just this month shes only 2mos here is she covered to the amnesty she want to go back home in our coubtry philippines pls...reply she dont want to be illegal here..
Dear UAE, please kindly let the former residents come back and find jobs.there are some residents like me who love UAE and its there home. yes indeed we made mistakes but not knowing the qanoon law but its never on purpose. i never did a single crime in my life in UAE.being a bit late contacting our sponsors in no doubt a mistake but it was never intentional it was careless. there are many people with visa cases. please be kind and support us. we love UAE and want to come back to make a living and contribute our services and efforts for UAE. We love UAE!! Jazak Allah Khair.